A boat by the side of the road invites inquiry. Driving by without hearing their stories seems an act of neglect. I don’t mean the sort of boat that’s sitting behind a car on a trailer with a flat tire. I mean the sort that squats in someone’s yard looking like it has grown roots, a boat that should be carving a carefree wake in the washboard surface of a wave tossed sea. It sits there among the trees whose solidity it mimics without so much as creating a furrow in the leaf littered lawn. You see them everywhere but most are not worth a second glance. Every so often one of these dry land dreams catches my eye with a stronger light. They radiate the kind of vibration I used to get when I was an antiques dealer in search of valuable merchandise. For me character born of craftsmanship and tradition have a palpable effect on the senses I have never been able to explain. It heralds a recognition of importance, that an item is well made and possesses a quality of design that is enduring and intrinsically valuable. The finest kind of of these nautical discoveries is the sight of a schooner. The problem with Schooners is they are usually so big, so inaccessible, and unattainable. Schooner rigs work best on a heavy displacement cargo hauling, people moving vessel. It’s a rare thing to come upon an example of the type on a scale that a working man can relate to. When I first came to the Pacific Northwest I did a lot of rambling around the Olympic peninsula. Naturally my eyes were always peeled for interesting boats. Carlsborg, Washington is a sprinkling of houses and businesses along a road by the same name. While driving that road one day I spotted a blue hull under a tarp setting back from the road. A subtle jangling of an old familiar vibe rattled in my head. 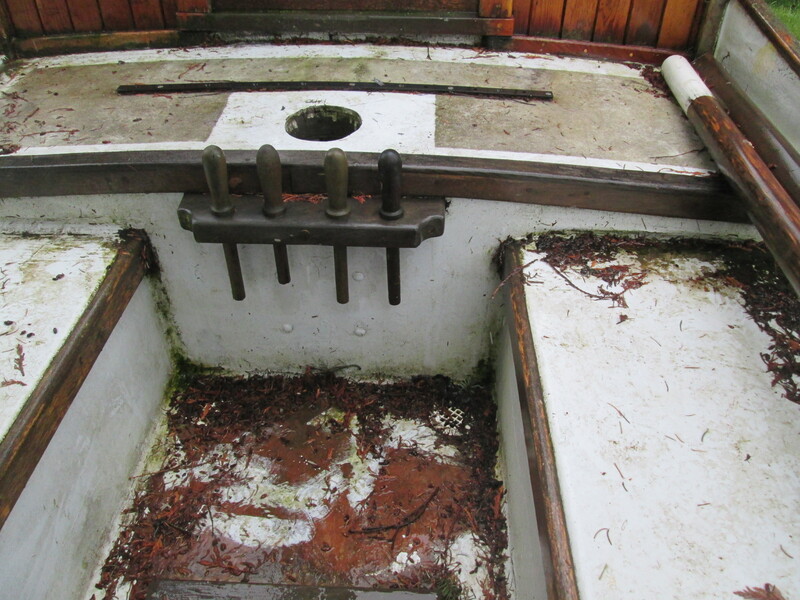 A set of davits protruded from the stern and a bowsprit pointed the way forward. She was clearly a traditional type of sailing vessel so I played the usual game in my head of guessing the rig type, make, model, and designer. My mental database kept coming up with a connection between this boat and the location. I remembered a boatbuilder from Carlsborg because I had ordered study plans from him for a design advertised in the long gone Small Boat Journal magazine back in the early eighties. This boat didn’t quite match the memory of the 22 foot cutter called the Dungeness Crabber by her designer but something spoke to me and remained in memory. I passed by this mystery boat many times over the past 11 years. She never appeared to go anywhere. The boat was waiting for something to happen. Note the nautical charm of carved trail boards and the vertical staving of the cabin. On one of my weekly drives through the Port Angeles Boat Haven I stopped to check out the bulletin board. A full color advertisement showed a picture of a familiar looking blue hull. There she was like an old friend discovered on Facebook. Better yet, the ad answered questions that had buzzed around in my brain for years. 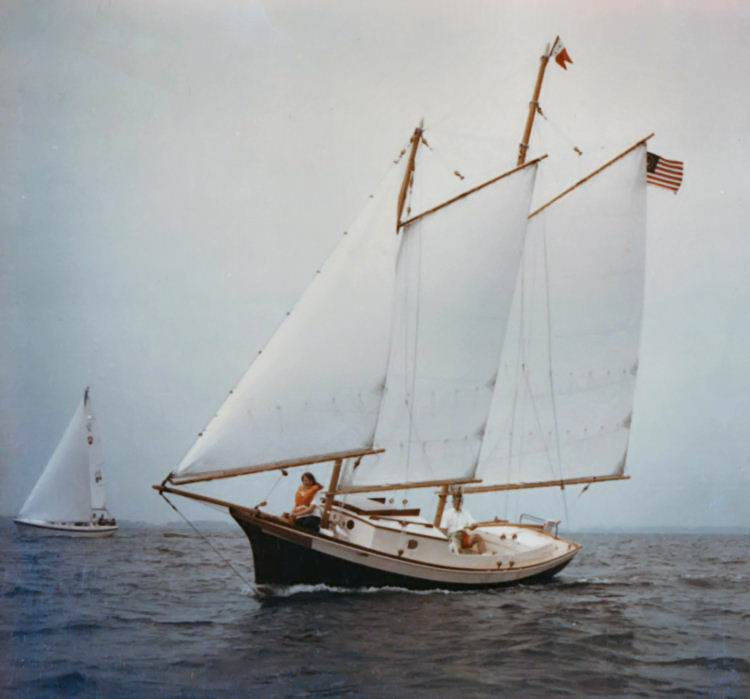 The heading said, ” Sailboat For Sale, 23′ John Atkins Gaff Rigged Schooner ‘Florence Oakland'” A number of pieces fell into place immediately. I have admired this design for years. 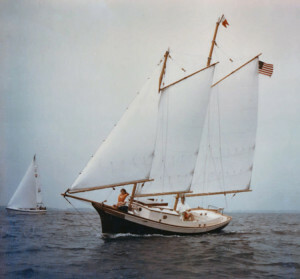 One of the few small schooner designs with a proven reputation. She measures 22’ 5″ long on deck and carries 297 square feet of sail in a well balanced set of main, fore and jib. She was built with an extended cabin and self-bailing cockpit making her one of the saltiest looking pocket yachts I have ever come across. This boat sits with no name on her transom. In fact she was never launched and was in need of some finishing touches. I had to know more about this little schooner because this boat comes complete with a very interesting history. John Magner was a boatbuilder with an eye for tradition. He built boats that were uncomplicated, salty and sound including William Short’s Great Pelicans, several of John Atkins designs including two schooners and various dinghies and daysailers. On a snowy day in February I drove to Carlsborg to meet with John’s sons and take a closer look at the boat. The builder began construction in the 1970’s. He worked on her intermittently between other building projects. Mr. Magner passed away in 1989 after battling cancer. This left the boat unfinished and she remained in that state ever since. The hull built from wedge seamed Alaska Yellow Cedar below the waterline and red Cedar above and the cabin and cockpit are basically complete. The interior needs some finish work and an old Volvo Penta is installed on solid engine beds but needs work and various things hooked up. There are tanks which were never fully installed. The masts and spars are finished and look to be in good condition. There are some bits and pieces of rigging scattered around but for the most part she needs some more standing rigging and a complete compliment of running rigging. There are no sails. Sanding and repainting are necessary. There is some rot around the corner post on the starboard forward cabin top. I was shown a blistered section of the plywood coaming on the starboard side. The boat has been tarped over all these years but did suffer these few effects from exposure. Bridge deck at forward end of cockpit has the hole for the mainmast and a nice rack of belaying pins. John Atkin designed Florence Oakland for Jacob Hess of Canton Ohio. It was named after his mother-in-law. 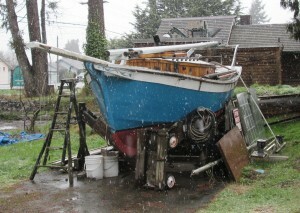 She was originally designed for plywood construction to make the boat trailerable. Several have been adapted for batten seam construction so it is not surprising that Mr. Magner opted for wedged seams. The sail plan spreads out a lot of sail area in a low aspect ratio that promises a good degree of stability. She would handle easily getting off a mooring with just the big mainsail raised. Atkin’s original concept was for a daysailer with a lot of cockpit space and a small cuddy cabin forward. This boat has an extended cabin going back to the main mast. While not creating spacious accommodations it provides a cozy situation for weekends and longer vacation voyaging. A simple galley arrangement will allow for basic boat camping meals and a whistling teapot dispensing hot drinks and charming ambiance. 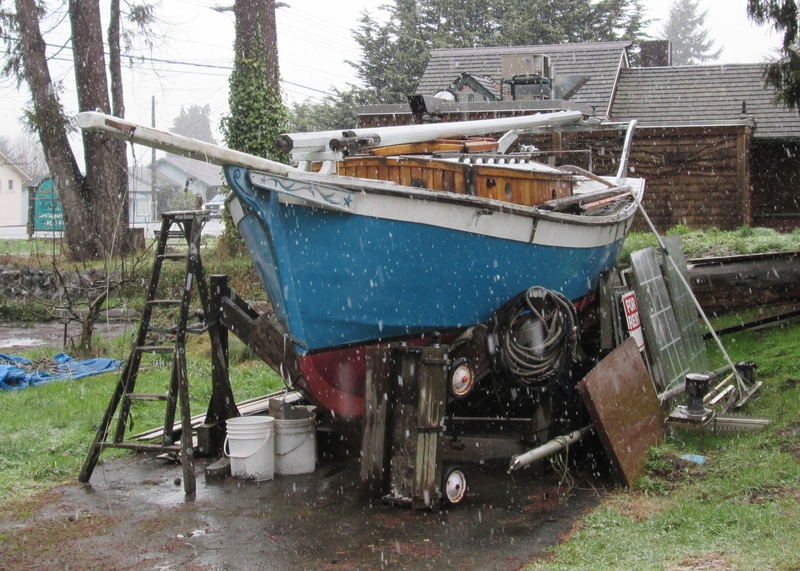 This entry was posted in Boats For Sale, Building, buying boats, Designs and tagged Boat design Quarterly, boat-building, carlsborg, cedar, John Atkin, magner, Olympic Peninsula, sailboat, sale, schooner, washington, Wooden Boat Festival, Woodenboat. Bookmark the permalink.